Beasts of Burden and Petty Differences together from Seattle pump out decades spanning hits and are fun, big energy and high octane outfits that bring the spirit, the moves, and the spontaneity by two of the world’s greatest rock-n-roll bands: The Rolling Stones and Tom Petty and the Heartbreakers. Six friends in 2016 decided to get together and play a few songs live from the timeless catalog of Tom Petty and the Heartbreakers. That night, Petty Differences was born. Combining live performance covers of the the more than 60 published credits from the prolific Petty, and benefiting local and global social justice issues, the band creates a one-of-a-kind euphoric sing-along experience that actually makes the world a better place. CAN’T YOU HEAR ME KNOCKING? That’s right! 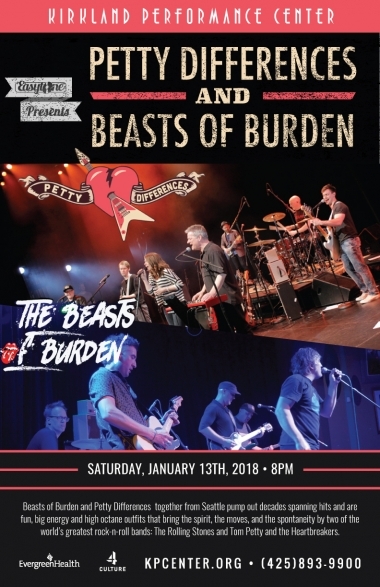 Ladies and Gentleman … The Beasts of Burden from Seattle are a fun, big energy and high octane band that pump out hit after hit by the world’s greatest rock-n-roll band: The Rolling Stones.